Today only, download the Kindle edition of Surfing with Mel for a mere 99¢ and get a free turkey while supplies last. 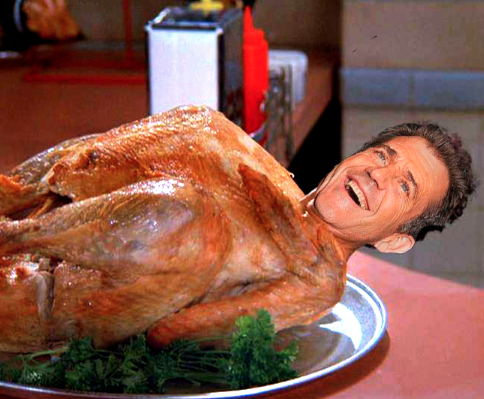 Wait a minute … we’re out of turkeys. So … er … today only … well, not only today, but … yes, only … 99¢. Get yours today! Image credit: Ryan Charles Trusell (yes, that Ryan Charles Trusell) by way of Seinfeld. P.S. We love ya, Mel! Crazy funny. You know, if Mel somehow stumbles across Korrektiv—that seven degrees of separation thing: someone forwards one of his friends an email about SWM, and that friend forwards it to Mel—he would soon realize that herein the road to his salvation lies. It’s that good. Between Ora et Labora et Zombies and this, RCT, you might just be on the way to becoming the Catholic Eli Roth. Is turducken kosher? Turgibson’s got to be treyf. My first script will be entitled “Chapel Fever”: A group of Steubenville freshmen go off on a weekend retreat in the woods, only to be stricken one after another by crippling existential angst and self-doubt. To be filmed in black and white and beige. Score by Adam Duritz. 99 copies sold so far! I sold 99 copies, but a film deal ain’t one. I promise I will buy one, either before or after I pass the cpa exam. Havent decided if it will be motivation or a reward. Soon it will be 999 times 99. Companys used to hand out turkeys at thanksgiving. In lieu of medical and dental. I’m going to write a story called “Surfing with Mel” about Mel Gibson taking an interest in Matthew’s screenplay and inviting him to his villa. And then Anglico can write a story about me writing the story. He proves Churchill right that we are all one character. Being neither fish nor fowl, is SWM good to read on Fridays during Lent? I remember when I taught at an Orthodox Jewish school in Dallas that there was some rabbinical controversy about whether turkeys were kosher. 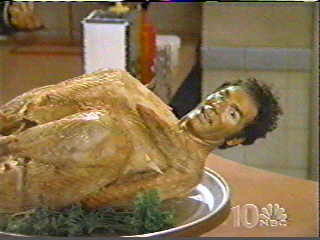 The argument against eating Tom was grounded in an obscure rabbincal text which cited the turkey’s (apocryphal) proclivity to eat its young.